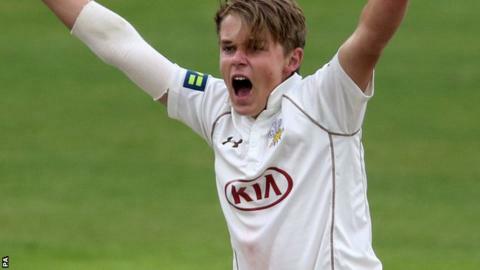 Sam Curran has been rewarded for his performances in his first season in county cricket with a call-up to the England Under-19s. The 17-year-old, younger brother of Surrey team-mate Tom and son of former Zimbabwe international Kevin, only made his first-class debut in July. He took 18 wickets and scored 178 runs in his first five first-class games. Hampshire's Brad Taylor captains the tour to Sri Lanka for a one-day tri-series including India in December. All-rounder Curran, who has just started the final year of his A-levels at Wellington College in Berkshire, took a five-wicket haul on his first-class debut against Kent. He has also taken 22 wickets in one-day cricket, which included Surrey's run to the One-Day Cup final earlier this month, and averages more than 35 with the bat in first-class cricket. Essex batsman Dan Lawrence is also included for the trip to Colombo. The 18-year-old right-hander struck 161 against Surrey in April in only his second first-class match, as well as two centuries in the England Under-19 one-day series against Australia in August. Highly-rated Hampshire leg-spinner Mason Crane also travels with the tri-series squad, which will serve as the final preparation ahead of the Under-19 World Cup in Bangladesh in January and February. England under-19 squad for tri-series in Sri Lanka: Brad Taylor (Hampshire, capt), George Bartlett (Somerset), Hugh Bernard (Kent), Jack Burnham (Durham), Mason Crane (Hampshire), Sam Curran (Surrey), Ryan Davies (Kent, wk), Ben Green (Somerset), Haseeb Hameed (Lancashire), Adam Hickey (Durham), Max Holden (Middlesex), Dan Lawrence (Essex), Saqid Mahmood (Lancashire), Tom Moores (Nottinghamshire, wk), Callum Taylor (Essex), Jared Warner (Yorkshire).